In 2015 Swiss watch brand Wryst has developed a totally new design with the ambition to redefine the "classic sport watch". The 45mm ULTIMATE bespoke bold round watch case refinement consists of the CNC tooled 0.6 mm deep signature on the sides. Offering a very modern sport feel with simplicity and distinction, the 3 hands Swiss timepieces designed with a strong dose of inventivness are fun, colorful and sincere. For each new watch reference two high quality silicone straps are included. 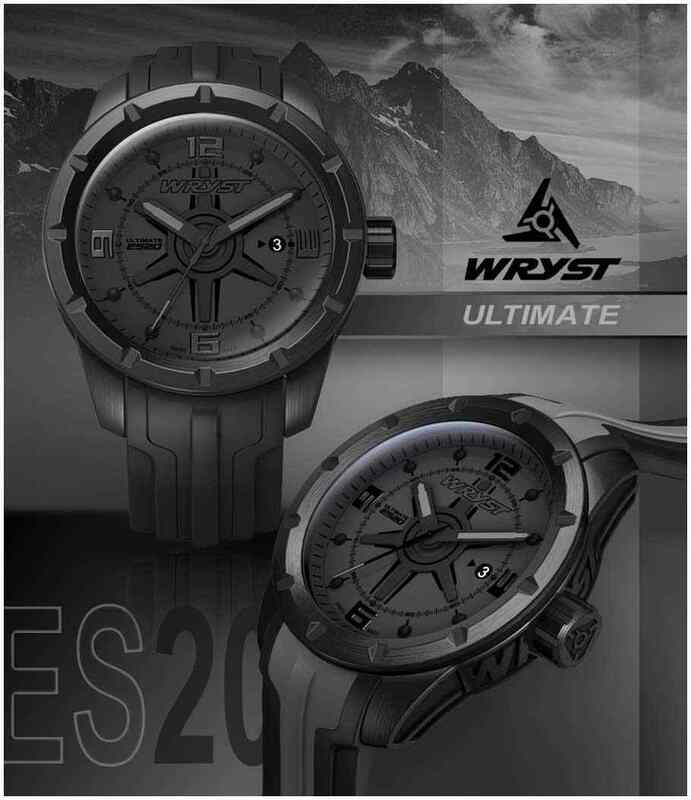 Wryst Ultimate ES20 All-black sport watch, black/grey and plain black strap included. 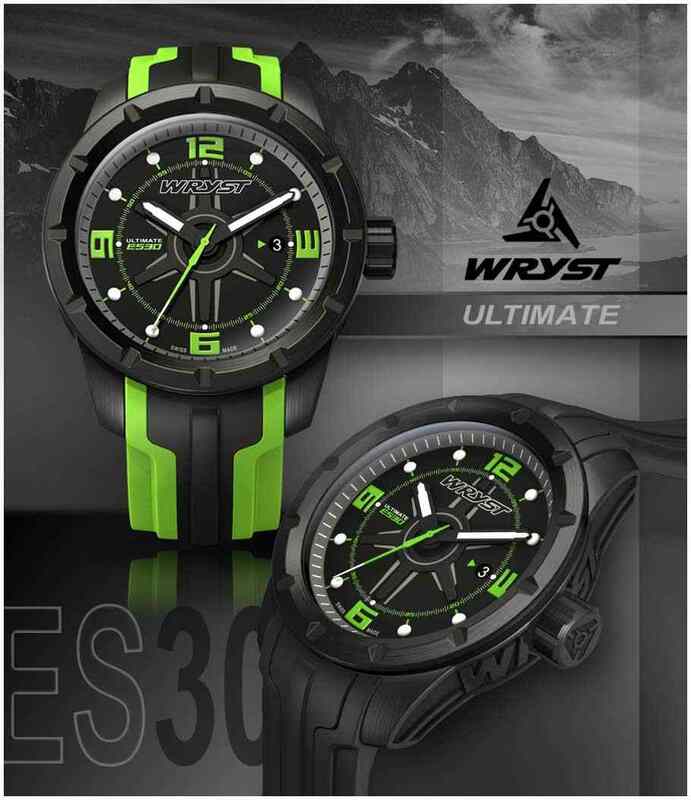 Wryst Ultimate ES30 black sport watch, green/black and plain black strap included. 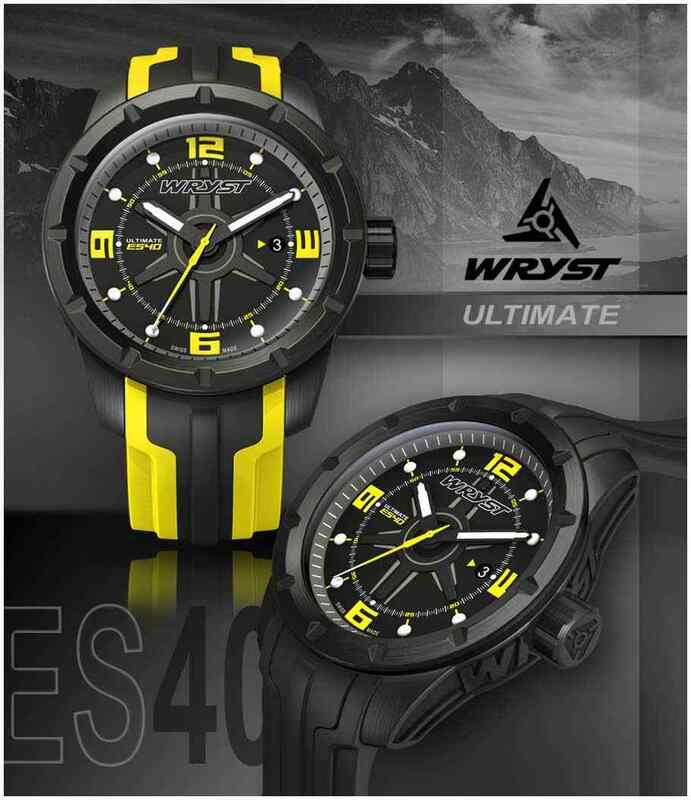 Wryst Ultimate ES40 black sport watch, yellow/black and plain black strap included. 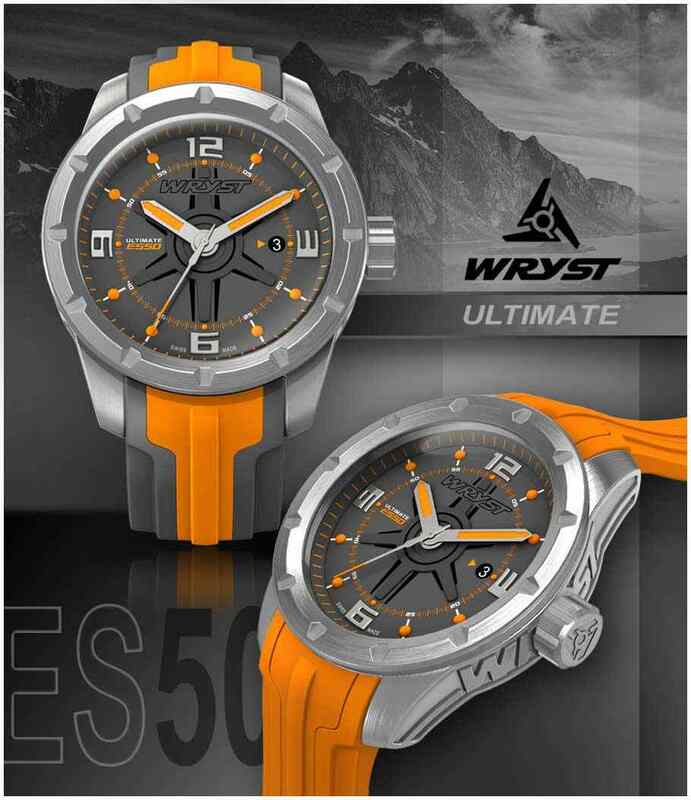 Wryst Ultimate ES50 stainless steel, grey/orange and plain orange strap included. 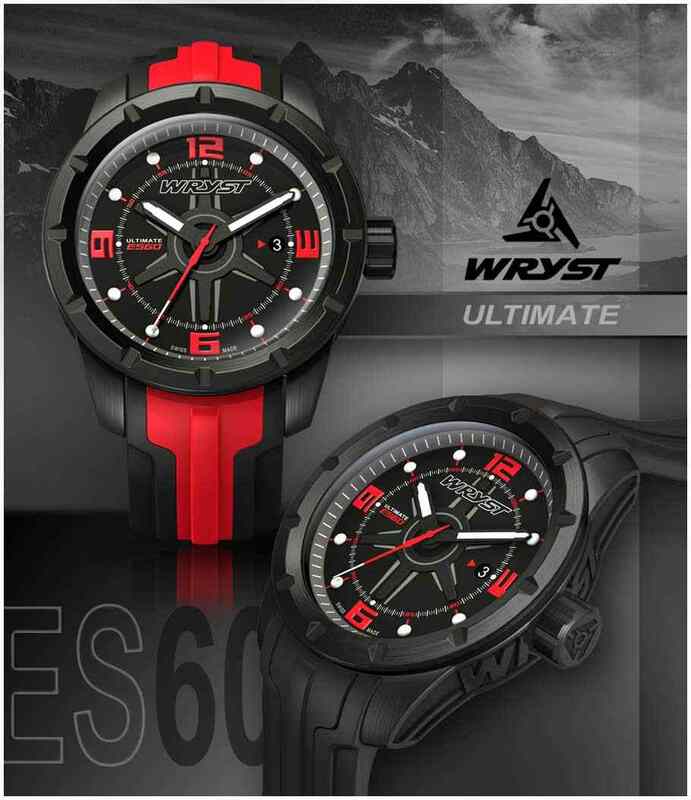 Wryst Ultimate ES60 black sport watch, black/red and plain black strap included. Like the initial first collection Wryst Airborne, the sport watches Ultimate ES20, ES30, ES40 and ES60 benefit of a scratch-resistant black DLC coating, as well as the screw down crown and square buckle. The ES20 all-black watch has also a black DLC coated case back. All watches produced with sapphire crystal have the limited edition number engraved on the caseback and have been submited to a static 200 Meters water resistance test. When are the Ultimate Sport Watch collection available to buy? The exclusive Swiss Made watches ULTIMATE all produced in limited edition of 99 pieces are available February 20th 2015. On average retailed between £415 and £495 GBP, these are excellent value for money and come in a luxurious wooden watch box with USB card for the one year warranty details and instruction manual. The Swiss brand Wryst exceeds in providing the most fun, unusal and exclusive Extreme Sports and Motorsports-inspired timepieces in the world.